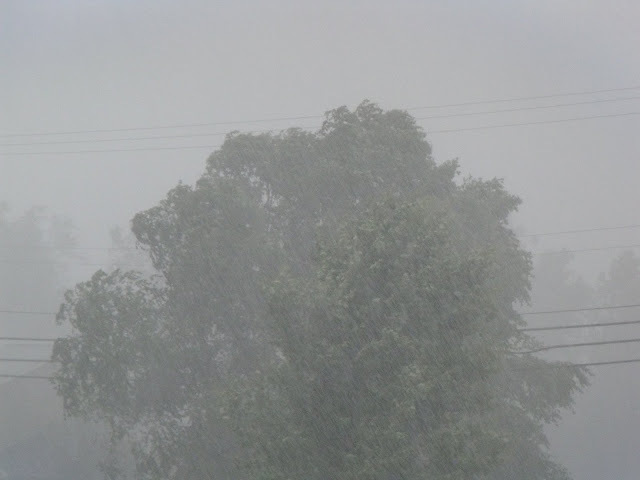 We've all experienced one of those afternoon thunderstorms that was surprisingly strong. 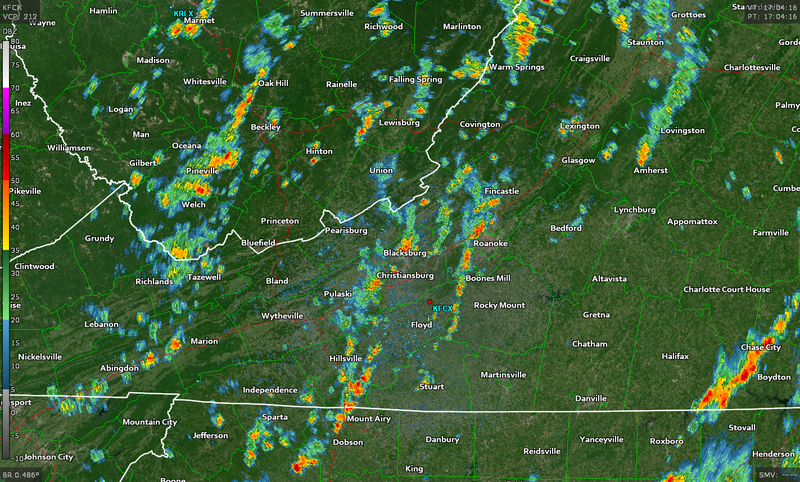 Summertime thunderstorms in the eastern United States can get rough in a hurry. It's not hard for a storm to produce strong winds or a few inches of rain in one sitting. These storms are usually right on the line between strong and severe—sometimes not enough to trigger a warning, and rarely enough to warrant a watch. While summertime thunderstorms usually aren't as strong as the worst outbreaks spring can throw at us, even a run-of-the-mill storm in July can be a force to reckon with. Not all thunderstorms are alike. Different types of thunderstorms form in different environments. A supercell, a storm driven by a rotating updraft, forms in an atmosphere high in instability and wind shear. The rotating updraft in a supercell makes it strong and resilient, allowing it to survive for hours and possibly produce very large hail, strong tornadoes, and intense winds. The vast majority of thunderstorms we see around the world are single-cell thunderstorms, or thunderstorms that develop individually and survive for about half an hour before dissipating. Single-cell thunderstorms are also known as pop-up, popcorn, garden-variety, or airmass thunderstorms, depending on who you talk to. 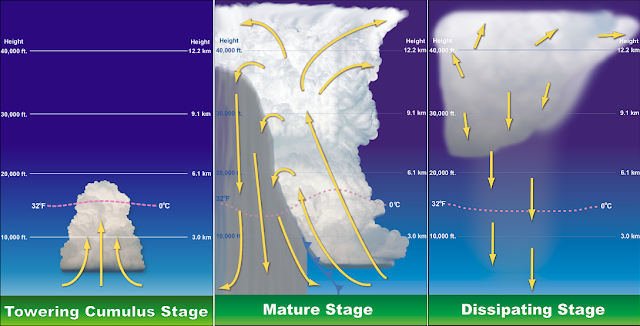 The common diagram of thunderstorm development we learned in elementary school—a single updraft growing into a tall, mature cloud, raining out, and dissipating—depicts single-cell activity. It's these single-cell storms that pose so much of a hazard during the summer months. Most of them are innocuous and just a headache at their worst, but some can grow severe in a hurry, producing damaging winds, flash flooding, and occasionally some hail. You don't want to hear a forecast say "I don't know," but when it comes to forecasting afternoon thunderstorms in the middle of the summer, sometimes we really just don't know. Painful as it is, waiting to see where the day's first thunderstorms will develop usually boils down to watching satellite and radar for signs of development. It's easy to see where they'll pop up at the coast because of the sea breeze. Looking on the ridges and eastern side of the Appalachians is a safe bet for initial storm development in the Mid-Atlantic and parts of the southeast. Everywhere else, though, it's a matter of small-scale features that trigger storm development. It's still a hit-or-miss ordeal once the storms pop up. Outflow boundaries, the leading edge of rain-cooled air that descends from a thunderstorm, usually determine where the next thunderstorms pop up. A single storm could lead to just one more storm or could be the catalyst for a dozen more. It's all a matter of the environment at the moment. The gist of it is: don't be too hard on your favorite meteorologist when she or he forecasts a 50% chance of thunderstorms in the middle of July. We can tell a lot about the weather in advance, but there are some things that are still wait and see. Summertime thunderstorms can take you by surprise, but they sure can have a hard time sneaking up on you. The lightning in warm-season storms can be prolific. The most intense storm complexes can produce thousands of lightning strikes an hour. Lightning is more vivid during the summer because thunderstorms have more moisture to work with, increasing the chance of frequent lightning strikes. The dramatic reduction in lightning deaths in the United States over the past couple of decades is one of the greatest weather success stories of the modern era. We used to average several hundred lightning fatalities every year back in the 1950s. The average number of lightning deaths now is just a few dozen a year. The reduction is due to better detection, warnings, education, and the simple fact that we're spending more time indoors now than ever before. The second hallmark of a pop-up thunderstorm in the summer is the heavy rain. Gully-washing, toad-strangling, cats-and-dogs kind of rain. We're dealing with this right now in parts of the east where persistent thunderstorms have dropped up to half a foot of rain parts of Virginia and Pennsylvania over the past couple of days. A great way to measure the amount of moisture in the atmosphere is precipitable water (PWAT). Precipitable water tells you how much rain would fall if you condensed all the moisture out of a column of the atmosphere. If the PWAT over your house is 1.75", it means that you'd have 1.75" in your gauge if all the moisture above your house fell as rain. Higher PWAT values indicate a better chance that thunderstorms can tap into a deep reservoir of tropical moisture and produce copious amounts of rain. That's why the recent storms in the southeast and Mid-Atlantic have all been deluges. The PWAT value near Washington, D.C., at 8:00 PM on July 24, 2018, was 2.19", higher than the 2.09" measured in Miami, Florida, at the same time. That's a deep reservoir of tropical moisture over the Mid-Atlantic, and it's that conveyor belt from the south that's responsible for the intense rain we've seen from thunderstorms lately. Most storms are just a nuisance, but some can grow severe. Aside from flooding from heavy rain, the most common severe weather threat we see from summertime thunderstorms is damaging wind gusts. due to microbursts. We usually see microbursts in the southern and eastern United States where there's deep, tropical moisture available to any storm that forms. A microburst is a small, focused burst of winds that quite literally drops out of the bottom of a thunderstorm. A distant view of a microburst falling out of a thunderstorm looks like a dark water balloon that speeds toward the ground and "bursts" upon impact, spreading out in all directions as severe winds. These downward bursts of wind can be as small as a neighborhood or they could affect an entire town. Microbursts, in addition to being lethal for approaching and departing aircraft, are usually responsible for those thunderstorms where the wind cranks up from docile to raging in a matter of seconds. Microbursts can form as a result of water loading and dry air entrainment. Water loading is a process that works just about how it sounds. Updrafts hold a massive amount of water aloft in a thunderstorm, especially in juicy storms like we see in the middle of the summer. If the updraft suddenly weakens, or the weight of the water is too much for the updraft to hold, all of that water can fall at once. The column of water and descending air speeds up at it approaches the ground, hitting the surface as a dramatic burst of severe winds. 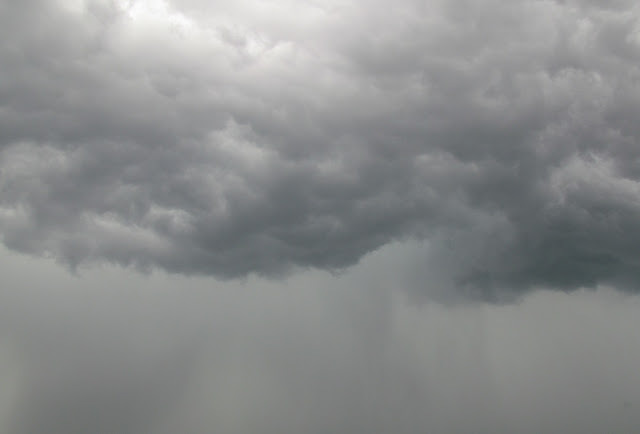 Dry air entrainment occurs when dry air intrudes into the mid-levels of a thunderstorm. The dry air causes the raindrops to evaporate; since evaporation is a cooling process, this leads to cool air developing in the middle of a thunderstorm. This newly-cooled air will start to sink as it's less dense than the air around it. As the dry, cool air descends, it causes more rain to evaporate, leading to more cooling, which leads to the air descending even faster. The descending air eventually breaks through the base of the storm and hits the ground. The wind really can crank up that fast. Microbursts are just as dangerous as they are frightening. Hail isn't a big threat in daily thunderstorms during the summer. 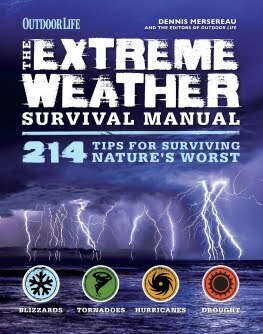 It usually takes a severe weather setup in order for thunderstorms to produce hail in the summer. An extreme recent example of this was an unusual severe weather outbreak that brought near baseball-size hail to central Georgia and produced large hail as far south as southern Alabama. Most of the hail you'll see in the middle of summer is on the smaller side. Sometimes it grows big enough to leave dents and break a few windows, but it's (usually) not like the honkin' hail you would see in April that leaves craters in your front lawn.